If there’s any such thing as a local ex-pat, then I’m it. My great-grandfather, a clergyman, first arrived in Belgrade in the late 19th century. My grandfather, his sixth surviving child, was born in the small house behind the Ružica Church in Kalemegdan Fortress in 1901. My mother, grandfather’s third child, was born in a Nazi occupied Belgrade, just days after the capitulation of Italy in 1943. I wasn’t born here. I didn’t even live here until I was 18, but I have grown to love Belgrade and can now call myself a Belgrader. Belgrade does that to you. It’s not a city you can call your own. It’s a city that adopts you. In 1876, Francis Mackenzie, a Scotsman, came to Belgrade on a mission. He was a businessman and member of a Nazarene group and had arrived to work at the British and Foreign Bible Society in Belgrade and to spread and encourage Christian practices and behavior among the Serbs. You’d think that would be an easy task as the vast majority of Serbs are Orthodox Christians. Francis tried his darndest to encourage the population to give up on bad habits, even tried banning smoking for a while, but with little success. The stubborn Scotsman that he was, he grew to love the city and it’s stubborn citizens and decided to settle down in Belgrade. In very little time, Mackenzie became a prominent member of Belgrade society and close friend of influential characters of the time, such as Čedomilj Mijatović, Serbian Foreign Minister, and Stojan Simić, President of the Serbian Parliament. In 1879, he decided to purchase a large piece of land on the eastern outskirts of the city from Simić’s son. The land consisted mostly of a few large ponds where Belgraders would often spend their weekends duck hunting, but Mackenzie was adamant in his claim that Belgrade would grow eastward in the future. He drained the pond and built a home for himself on it. The locals soon adopted a new name for the land – Englezovac (“Englez” being the Serbian word for “Englishman”). Mackenzie’s prediction that Belgrade would grow to the East was on the money. That plot of land is now the busiest point of downtown Belgrade, Slavija Square (a.k.a. Trg Dimitrija Tucovića) and the Vračar Plateau. The Plateau, with an absolute height of 134 meters, was deemed as the ideal spot for placing Belgrade’s first meteorological observation station in 1891. 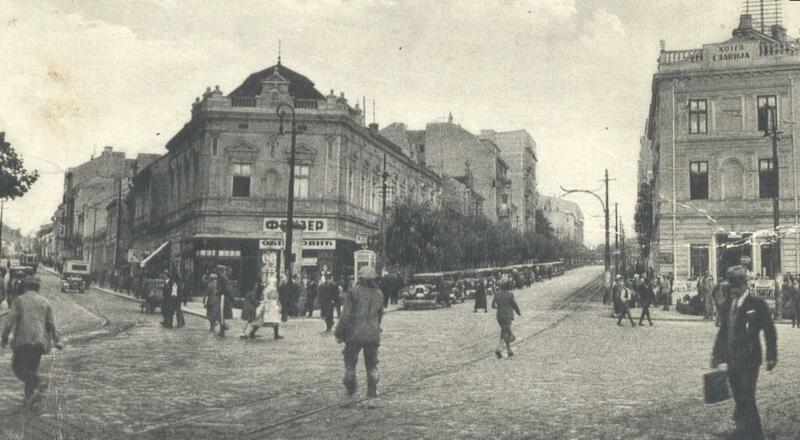 Mackenzie’s house was torn down after WWII and one of the first movie theatres, the “Slavija” theatre, built on the spot. Today, to our great misfortune, the proverbial parking lot stands where the Scotsman’s house once stood. Soon after he purchased it, Mackenzie began parceling the land and sold these parceled lots later on. Sometime in the 1880’s he donated some eight thousand square meters for the construction of the Saint Sava Temple (Saint Sava Orthodox Cathedral). His name was inscribed and can still be seen on the list of Great Benefactors of the Temple, just below the names of members of the Serbian Royal family and senior dignitaries of the Serbian Orthodox Church. One of the main streets around Slavija, earlier Maršala Tolbuhina Street, carries Mackenzie’s name today (Makenzijeva). Francis Mackenzie left Belgrade in 1895 but Slavija and the Plateau continued to grow. The “Slavija” Hotel was erected, the remains of the socialist leader Dimitrije Tucović were reburied in the center of Slavija Square in 1947, and the first “McDonald’s” in all of Eastern Europe opened it’s doors in the Spring of 1988. Oh, yeah. And they built a parking lot. So what I’ll ask you to do, next time you’re roaming the city, is NOT to look at what’s there. Do yourself a favor and look at what used to be there. Or look at what might be there in the future, like Francis did. Just don’t look too long. The city just might decide to adopt you. Is this your great grandfather who is mentioned in the following travel digest from the early 1900’s? No, that is’t my great grandfather. My ancestors came to Belgrade from Sremski Karlovci and Kraljevo. But this is wonderful! I’ll have to look into it some more! Forgive me. Being Scottish with a passion for Belgrade I must have read what I wanted to read rather than what was written. I thought at a first glance you were a descendant of said Scotsman.